[Click refresh for updates and log in for the fastest feed] News Update: Apple’s iPhone 4 Screen is Better Than Your Retinas 2:55 Applause That’s the end. Jobs thanks the iPhone 4 team, and wraps it up. That’s the end. 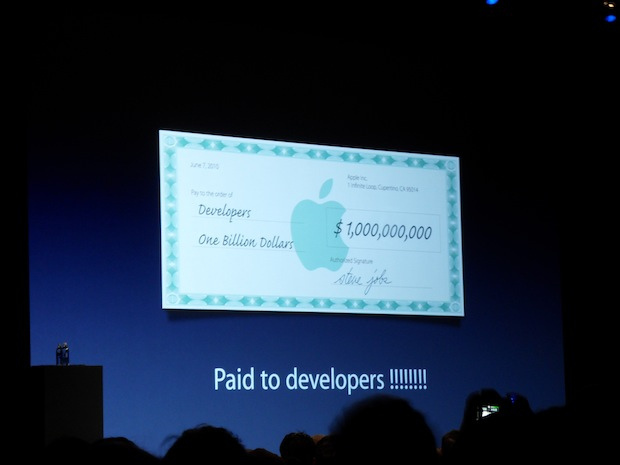 Jobs thanks the iPhone 4 team, and wraps it up. Thanks to everyone who tuned into this live coverage. Please drop a line and let us know what you liked, and whether we should do this again next time. That means the only 8GB iPhone left is a 3GS model. Shipping to U.S., France, Germany, U.K. and Japan on June 24th (the rumor was correct). In July, shipping to 18 more countries. 24 more in August, and 40 more in September. After that, it will go on sale for the NASA rover currently stations on Mars. Accessories: Dock for $30. Case–described as a “bumper”–for $30. iPhone OS4 upgrade plan: the 3GS, and iPod Touch will get the update, and the 3G too with some restrictions. Upgrade is FREE, starting June 21. Pre-orders begin a week from tomorrow (June 15). Demo glitch. Jobs: “This never freezes up, so you guys must not have turned off your WiFi.” Who us? And hey, doesn’t your AT&T 3G signal work reliably enough for a demo? FaceTime: It will only work with WiFi! If iAd is feature number 8, then where is video chat? Nissan will use iAds to advertise the Leaf — you can reserve a Leaf with an iAd. App shows how far you can drive on a dollar. And Nissan is giving away a car, through the ad. That’s quite an advertisement, you’ve got to admit. Look for that ad starting July 1. This is not yet confirmed by Jobs, but that’s what we’re hearing. Let’s see if it pans out. You can now share the book you’re reading across different devices for no extra charge (gee thanks, just like the paper version). Also, Amazon and B&N offer the same thing, why is everyone clapping? Automatically synchronizes bookmarks and notes. Kindle does this as well, I believe. The Notes function is very much like Post-It notes. And you can highlight, copy and paste text. Reading books on the phone screen is not exactly a pleasure, but that new retina display ought to help a lot. Bing will be added as a search option. Google is still the default, but that’s a nice gimme for Microsoft. “Golden master candidate” going out to developers today. Okay, so we’re all turning of WiFi …. NOT. 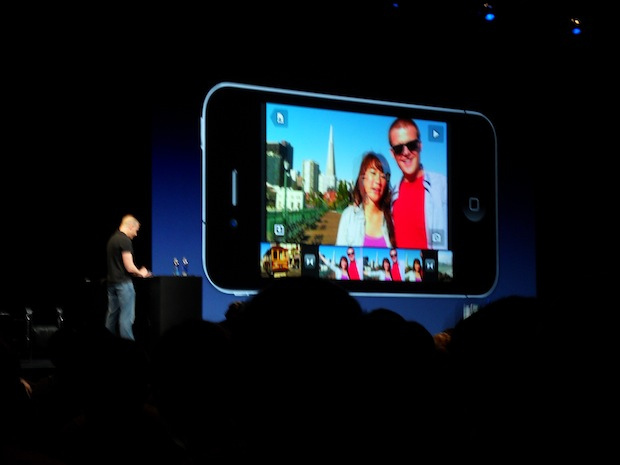 You can edit video, add photos and music too on the new iMovie app. “Photos automatically get a Ken Burns effect on them,” says Jobs. He’s talking about those image pan transitions that are a hallmark of both the documentary filmmaker and iPhoto slideshows. Location, location, location: You can now geotag the videos too. Cost: $4.99 — Jobs adds: “If we approve it.” Haha, Steve made a joke about his strict app store policies. Jobs talks down megapixels (smart, since they don’t really effect picture quality–David Pogue is very pleased right now). 5MP camera with a “backside illuminated sensor” (like a firefly?). LED flash. HD video recording! 720p at 30fps — going straight to the Flip cam market. But 720p smartphone video is not new, other phones have that same feature, and it’s most often terrible quality. Video editing right from the phone, is that iMovie? Yes! iMovie app for the iPhone. I guess everyone needed a breather? Oh, he’s showing off the gyro (not the sandwich, the sensor). And it fell down. 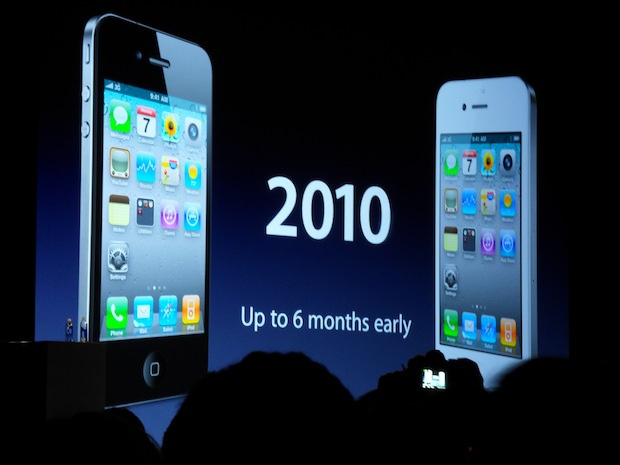 The iPhone 4 will have a 3-axis gyroscope with accelerometer, for a total of 6 axes now. New “coreMotion” APIs. Great for gaming and Augmented Reality. 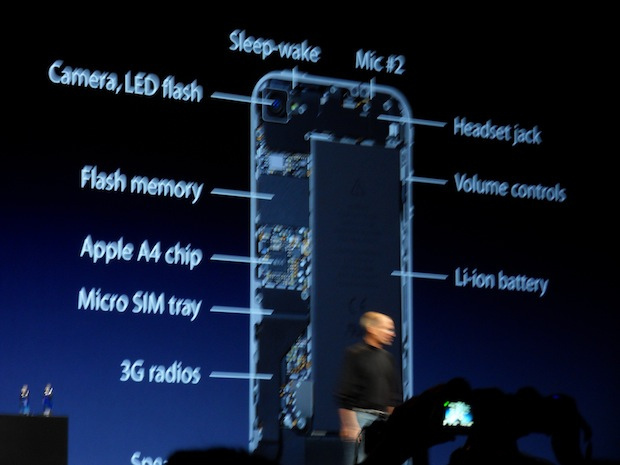 That’s right, the iPhone 4 will use the A4 chipset. Saves beaucoup battery life, “up to 40% more talk time,” says Jobs. can I get a fact check on that? 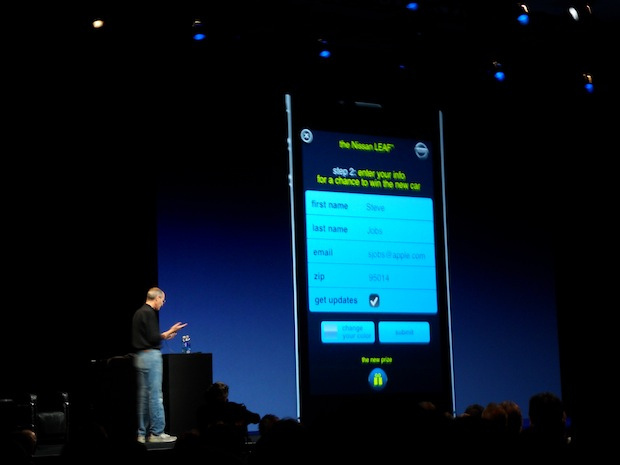 3.5-inch display, 960×640 (as Gruber and Daring Fireball predicted some months ago). pry the wireless from the cold dead fingers of this crowd. Jobs demonstrates the display with some photos. The difference is obvious, the new display is much clearer. He’s given up on the demo because of the WiFi problem! 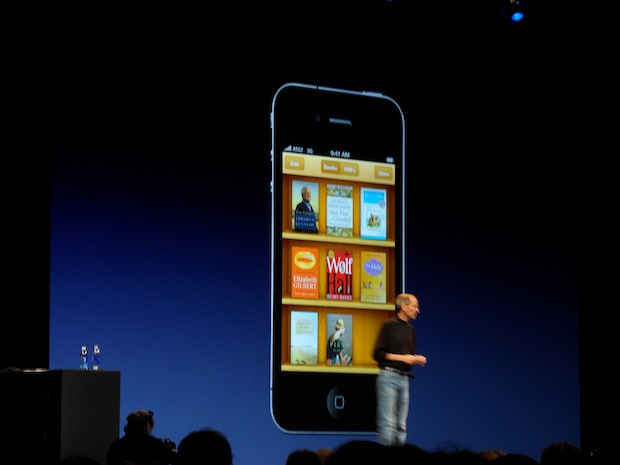 iPhone OS 4 will automatically uprender apps to the new display. The new iPhone is “the biggest leap since the original iPhone,” says Jobs. 8 new features. 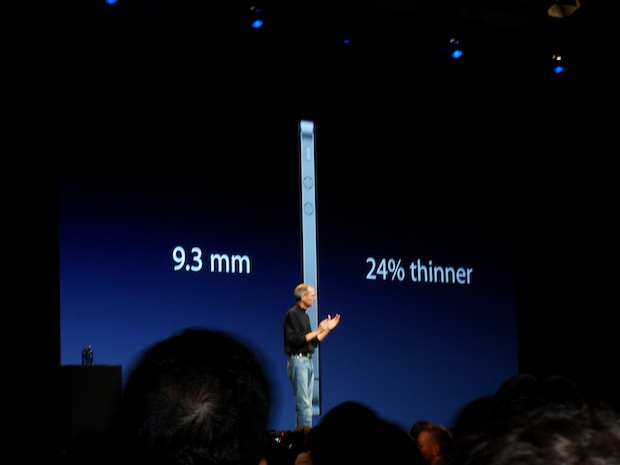 9.3mm – “Thinnest on the planet,” says Jobs. LED flash with the camera. Two microphones for sound canceling. The stainless steel border is part of the antenna, it turns out. And now he’s bragging about how much more popular iPhone is than Android, using the Nielsen data that we wrote about last night. Activision is bringing everyone’s favorite music-faking game to the iPhone. Is there a peripheral involved? Nope, more like TapTap, and you do strum the screen. 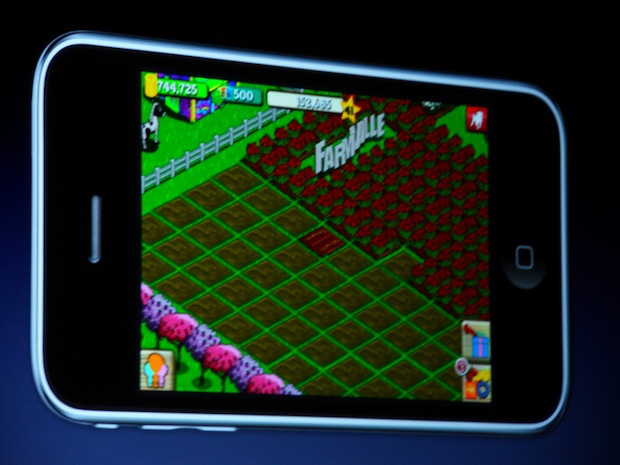 Mark Pincus on stage to introduce.. Farmville for iPhone. Get ready for a collective ‘argh’ as Farmville spreads from Facebook to the mobile masses–with push notifications, anytime anywhere (set your alarm for that 2am harvest). Your carrots are ready to be harvested, Zynga’s profits are too. The app wil be available by the end of June. Netflix founder and CEO Reed Hastings takes the stage. 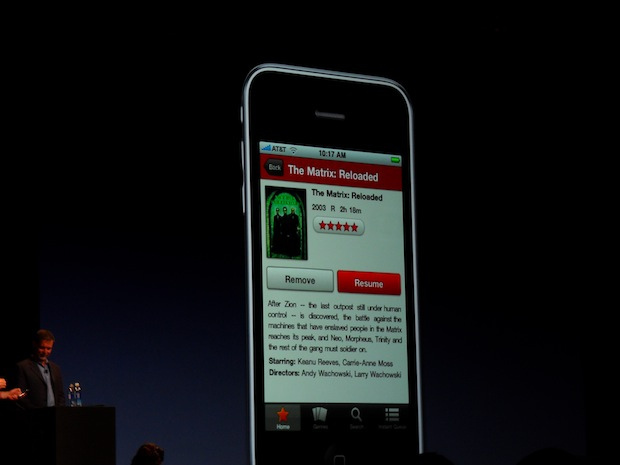 Netflix for iPhone is coming this summer, for free. the Netflix iPad app is fantastic, you can stream movies right from the interface. Now it will be available for iPhone — but which ones? 3GS or only the 4? Nothing much new here folks. New features: Notes and Bookmarks. Notes, like Post-Its, for your book pages. And support for Adobe .pdf files — wait a second, no Flash support, but they are going to translates .pdf? Makes sense if you want to rule the reading market. Here’s the kicker: the .pdf books will live on a separate shelf from the regular iBook Store bought titles. Two different tabs. from the past 5 years of Google ads on PeriodicTable.com” – an early jab at Google, expect more to come before this keynote is over. Here’s an iPad love montage, with international customers and their Pads. Apple is “making iPads as fast as we possibly can.” There have been 35 million iPad app downloads to date. A note for everyone following here: We are not going to give you a live transcript of every data point and standing ovation for Jobs. Our goal here is to filter the highlights, add context, and point you in the right direction for more details. And Steve Jobs is on stage. 10am: The show will be starting any minute now. 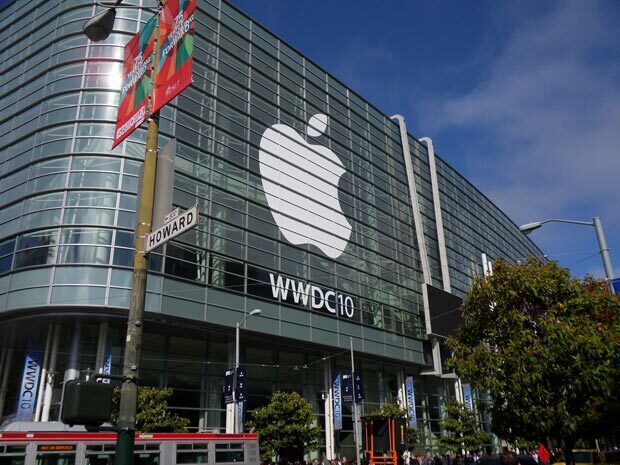 Will there be liveblogging with iPads? Yes, of course. As well as lots of neckbeards and t-shirts with jokes on the front. Louis Armstrong playing as we wait for the start. Odd to see that the Apple Store is still up. Early word is that the keynote might open with a short video of John Hodgman (aka the PC guy) getting someone drunk at a bar in order to steal his iPhone 4 prototype. Yuk-yuk. Register now for faster updates and to comment.